Avenue One Condos built in 2005 is located at 1st and Clay in Belltown. 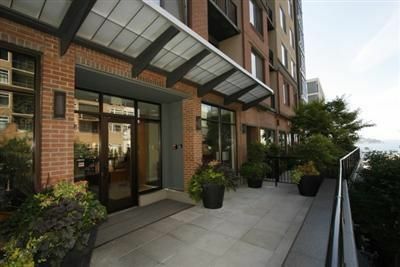 Built by Intra-corp, this 13 story building completed in 2005 satisfied the demand of many buyers looking to get into the Belltown market. Designed by GGLO Architects, Avenue One is comprised of 116 homes offering a variety of floor plans: studio, 1 bedroom, 1 bedroom plus den, 2 bedroom, and 2 bedroom plus den. Studios start at 469 square feet and the largest penthouse is around 1,333 square feet. It has a coffee shop on the ground floor and over 2000sf of retail that is currently vacant and for sale. Among many other projects within blocks of this 5 year old building (The Parc, Vine, Seattle Heights, Mosler Lofts, Ellington, Concord, Mosler Lofts, Bellora and Trio) Avenue One will continue to be compared to its neighbors.